The selection of the best of the best will be controversial in every case. There are several grades of tequila, but they are not gold and silver! Jose Cuervo may be the #1 selling tequila in the world … Patron may currently be the most popular top shelf tequila. However, they must deliver the best-tasting Margarita to be the best of the best! There are two categories of tequila: mixto and 100% blue agave. The best tequilas are made from blue agave, and will always say “100% Blue Agave” on the label. If that isn’t on the label, then the tequila you’re looking at is a mixto, made from a blend of different sugar syrups. Avoid these tequilas! A field of Blue Agave. 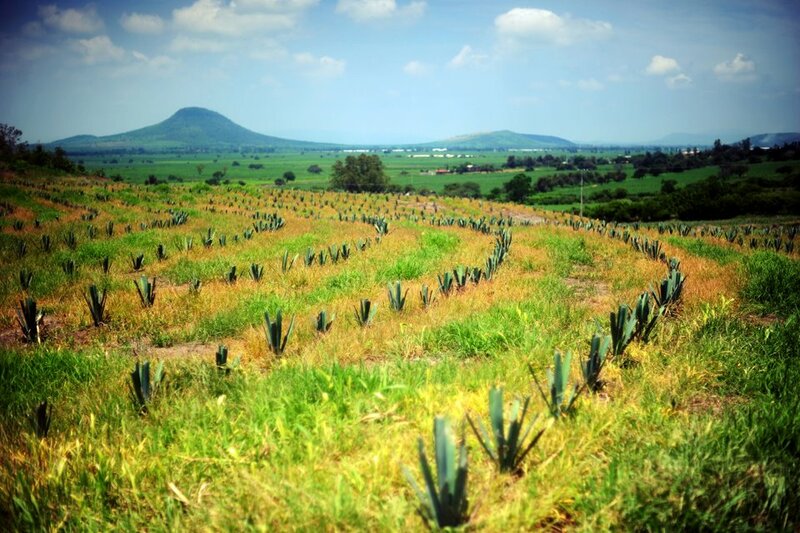 Picture from Don Julio tequila, which harvests after 7-13 years of growth. Jose Cuervo is a mixto. The price is often low … and the quality matches that. Jose is not my friend. Reposado tequilas offer a good compromise between price and depth of flavor. Some people prefer Margaritas made with blancos, but reposados are generally recommended for Cadillac Margaritas. Many, many margarita recipes use pure lime juice. Most bars, however, use a sweet & sour mix instead. Go to the store, and you can buy margarita mix which is a mix of juices, sugars and colorings. After you make home-made sweet & sour, you’ll never buy another bottle from the store. 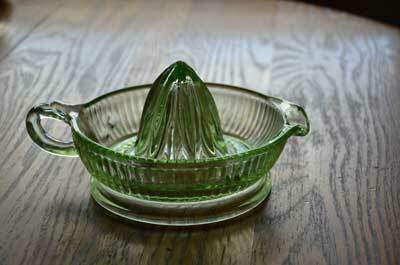 This green depression glass antique lemon reamer is ideal for squeezing lemons & limes. Check out your local antique mall for this affordable collectable that will be very useful in your kitchen. Use a lemon reamer to juice the limes and lemons. After reaming the fruit, using a citrus squeezer will maximize yield from the limes (you may find this step unnecessary for the lemons). Heat the water until it boils. Stir in sugar, and then cool to room temperature. Add the juices and zest. Refrigerate overnight. Strain out the pulp and zest before use – unless you like your Margaritas chewy. Most of the literature I’ve reviewed says that Grand Marnier is the right choice for a Cadillac Margarita. We’ve now got 5 kinds of orange liqueur that we’ll be sampling. Tough, tough work ahead of us!